Description: Clip art photograph of Staff Sgt. 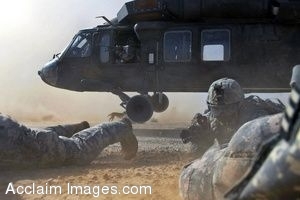 Craig Stevens (center), of Pottsville, Pa., with Headquarters and Headquarters Company, 1st Battalion, 112th Infantry Regiment, maneuvers through a cloud of dust to get into position between two other Soldiers, June 3, after dismounting the departing UH-60 Blackhawk helicopter. The 56th Stryker Brigade Combat Team Soldiers air assaulted into the desert near Nubai, northwest of Taji, along with Iraqi army soldiers to conduct searches for possible weapons caches. Clipart photograph by Department of Defense Public Domain.